We Also Fix Circuit Board Issues. Call Today! Garage door openers have certainly made life more convenient for us, but as is the case with most electromechanical devices, things can go wrong from time to time. When they do, it's important to call in the right technicians who can quickly and safely fix whatever is causing the malfunction. This device is in charge of automating the performance of the system, so it's functionality is absolutely crucial. Is your garage door opener making strange sounds? Does it look like it is opening your door a lot slower than usual? Keep in mind that tinkering with this device it can be dangerous, due to the different electrical and mechanical components involved in its operation. If it is a relatively new opener and is still under warranty, playing home handyman with it can result in the warranty becoming invalid. Our technicians have the skills and the knowledge to take care of any issues so it is best to leave things up to us. If your opener is having trouble opening the door, there could be a problem with its motor. If it seems to be unable to close, the issue could lie with the safety sensors. Whatever the case may be, you can count on our team to quickly resolve the issue. 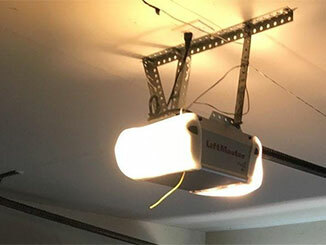 One of the best ways to identify and prevent any problem with your garage door opener is with regular maintenance. Our technicians have years of experience and will not only repair any problems you may be experiencing, they'll also carefully inspect your opener motor and circuit board, and take care of any minor issues before they become a major problem. We will also test the safety reversal mechanism, and ensure that the alignment of the photoelectric sensors is correct and that they are able to properly detect obstacles. Our team at Garage Door Repair Pflugerville is just a phone call away. Whether you're looking to have a new opener installed, or need us to fix some part of your current unit, from the drive system to the interior motor, we'll be happy to help. Give us a call today to schedule a service appointment.